This Painting is by Francisco Goya (1746-1828) from Spain. The name is this painting is "Fire at Night". It was painting during the romanticism period, which is when most of Goyas pictures were created. When analyzing this picture you can notice that is very dark except for the background where the fire is aflame. All the characters of the painting are hidden in the right bottom corner since they are running away from the fire. It is a large group of people who are probably coming from a town that has been overthrown and destroyed. The faces of the people are not clear but their body language tells a lot about the struggles they are having trying to save one another. By having the picture so dark except for the color of the flames that light up the bodies of the victims shows that the fire has overthrown them all and they lost. 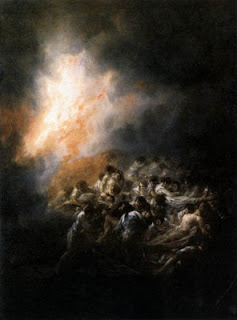 Also by not showing faces of the people, Goya could be showing that they didn't matter only that they suffered. When I first looked at the painting I noticed the fire in the very high center of the painting then I slowly looked down to the right and seen the large group of people that seem to fade into the darkness. The contrast is very dark and yet the brightness of the flames bring out the pale color of the people. There doesn't seem to be much space because everyone is crowded into one corner as if there is no where else to go and the darkness of the smoke and flames consume the rest of the painting.